Why Must A Person Possess Ovaries To Enjoy Yogurt? Have you ever seen a man eat yogurt, with your own two eyes? Are you a man who has eaten yogurt? Do men eat yogurt? Sarah Haskins has mocked Jamie Lee Curtis and the dancing women in yogurt commercials before, but seriously: Do companies even want men to eat yogurt? Milk commercials make it seem like dairy is for everyone. You can certainly eat cheese and ice cream, no matter your gender. But yogurt? No Boys Allowed. And just to prove a point, a new frozen yogurt joint has apparently arrived in NYC. 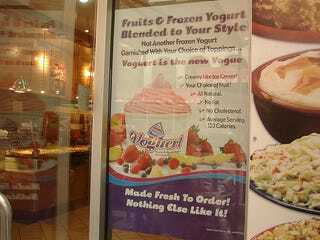 As seen in the picture at left, yogurt is so trendy, it is now Voguert. There was a time when anything remotely "diet" was automatically for women: Lettuce, cottage cheese, soda. Times have only changed so much: Somehow, even though a dude will drink Diet Coke you just never see a man peeling off a lid of yogurt. And how much are you willing to bet zero guys are interested in Voguert? Steak has been reclaimed. Hungry-Man dinners? Not exactly "just for men," seeing as how they are made up of fried chicken and meat smothered in mushroom gravy. (Name a woman who doesn't like gravy!) But yogurt remains a prisoner of the estrogen ghetto. Can you think of any other food that is so gender-specific? What Does Your Entrée Say About You?